People generally have no idea what things should actually cost. We usually assign value by comparing to other similar products. Extremeness aversion is demonstrated in the chart above. 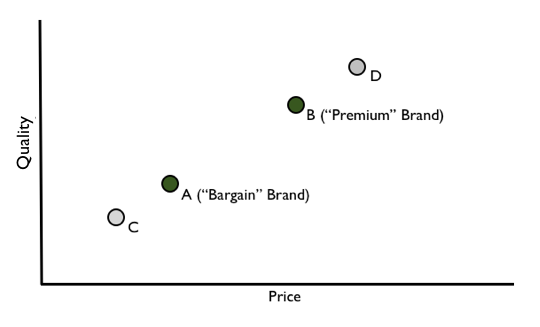 Traditional economics suggests that, most other things being equal, the cheapest product (C) will sell the most. But that’s not what happens. In fact, products A and B sell the most, but only with the help of C and D.
Suppose a store is selling vacuum cleaners. They have just one $595 option. People rarely buy it because they’re hard pressed to know if it’s a good deal or not. Then the store manager introduces a second option for $395. Now most people are buying the cheaper one, but compared to other stores, very few vacuum cleaners are being bought. Something weird happens when the store owner introduces a third, super cheap $195 option: he starts selling vacuum cleaners every day, and 90% of sales are the $395 option. Finally, when he introduces the an $895 super-deluxe model, he sells more of both the $395 and the $595 models. This is extremeness aversion, and it’s been proven time and time again. This is just the tip of the iceberg; I recommend starting your exploration of pricing with this book. ← Free For Early Users?